The purpose of this article is to help both sides think more clearly and consistently about justice by outlining the different fundamental theories of justice which are at play here. The classical definition of justice is giving people what they are due. The potentially controversial part is in figuring out what people are due. How does one determine what someone else is owed, and who owes it? These are the questions which must be answered if we are going to move forward in this whole debate about social justice. The various answers to these questions will prove to be the fundamental dividing lines between those disparate parties arguing about justice today—especially within the Church. Notice that justice involves multiple factors. It involves a recipient (or one might say, a “claimant”) to whom something is owed. It involves a giver, from whom something is owed. And finally, it involves something (an object) which is owed. So, one of the goals of a theory of justice should be guidance in figuring out who and what ought to fill those respective roles in any given situation. While there are many highly nuanced theories of justice, there are two dominant fundamental theories, of which most of the others are slight variants. The first one I will call the need-based theory of justice. On this theory, need determines what one is owed. The recipient is any person who is in need, and the object owed is whatever will satiate that need. This gives us the recipient and the object, but not the one from whom it is owed. How does this theory of justice determine who owes assistance to the needy? Well, the only possible answer is: the un-needy—the able. Now we have a full picture of this need-based theory of justice. Justice, on this view, consists of the able alleviating the needs of the needy. You might recognize this from the Marxist slogan, “from each according to his ability, to each according to his need.” While this is a Marxist-style conception of justice, it’s important to realize that one can hold to this view of justice without being a full-fledged Marxist. In fact, one could hold to this view without believing in government-forced redistribution. 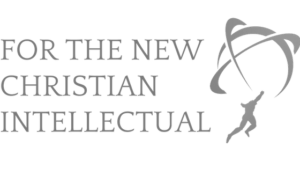 Tim Keller, and others at The Gospel Coalition, have attempted just that. 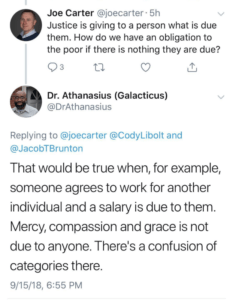 While affirming that the failure to give to those in need is “not just uncharitable, but unjust”1 and even “robbery,”2 they insist that they do not necessarily advocate for the government to get involved to correct such injustices. You might ask, “why shouldn’t the government right the injustice of robbery?” which would likely put Keller & Co. in a difficult spot as they attempt to demarcate where they think the government should be involved, and where it shouldn’t. And they might even have a half-decent answer. However, I don’t think that government involvement is the only—or the most important—problem with this need-based theory of justice. The more fundamental problem with the need-based theory of justice is that it directly undermines the gospel. Every Christian, in studying the details of the gospel, learns very early about the crucial difference between the justice of God and the grace, or mercy, of God. Justice, we are taught, would be God giving you what you deserve, which is eternal wrath. Grace, or mercy, on the other hand, is God giving you undeserved favor—in spite of the wrath which you deserve. But according to the need-based theory of justice, what you deserve is determined by what you need—and we certainly don’t need eternal wrath. So, on this view of justice, it seems as though God is actually very unjust. Rather than sinners deserving eternal wrath from God, they deserve to have their needs met by God—and anything less would be an injustice on God’s part. I’ve drawn out the implications of this particular problem elsewhere, and many of the responses I’ve gotten have indicated a common tactic of applying different standards of justice to God and to man. 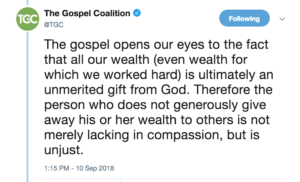 The objection goes something like this: “God’s relationship to His ‘wealth’ is so radically different from man’s relationship to his wealth that you can’t possibly compare the two, or hold them to the same standard.” There’s certainly some plausibility to this objection. God’s relationship to His ‘wealth’ (i.e., the things which are rightfully His which we humans need) is radically different, in certain respects, from our relationship to wealth. Granted. But does it follow that God and man adhere to radically different standards of justice? I don’t see how that follows. It may be true that the same standard of justice is applied in radically different ways to God and to man, given the radical differences between their respective relationships to their wealth. But if we say that they have different standards of justice—that entirely different theories of justice apply to them—then we are saying that there is a complete equivocation between God’s justice and our own. An equivocation of this kind would be a massive theological problem (which I do not have the space to expound on here), and I don’t think it can be maintained in the face of careful study of the Scriptures (which I will attempt to demonstrate below). Everything Is A Gift From God, Therefore…? The author of this post (most likely Tim Keller), intends to draw a certain conclusion from the fact that everything we have is ultimately a gift from God. What is that conclusion? It is not merely that we have an obligation to be generous. Surely, no Christian would disagree with that conclusion. The conclusion is also not that genuine Christian compassion is supposed to result in generosity, which most Christians would also affirm. No, says the author. It is not just that the failure to be generous is “lacking in compassion,” it’s that it is “unjust.” This is the conclusion the author wants to draw: that generous giving is an act of justice, and the failure to give generously is an act of injustice. The author is explicitly not arguing about the Christian obligation to be generous (which is assumed under the concept of “compassion”). He is arguing for a certain view of justice. So, the argument can be restated as follows: Everything we have (“even wealth for which we worked hard”) is ultimately a gift from God. Therefore, justice demands that we generously give that wealth away to others. But does that conclusion follow? Remember, justice refers to what one is owed. Does the fact that our wealth is ultimately a gift from God mean that others deserve it? It certainly means that we owe it to God. But there are some serious problems with the assumption that we “therefore” owe it to other people. The second problem with this line of thinking is that it ignores the clear teachings of Scripture on the concept of private property. The concept of private property means that one’s wealth (for which he has “worked hard”) is rightfully—i.e., justly—his own. And this concept of property is assumed all throughout Scripture, but most clearly in the command, “thou shall not steal” (Ex. 20:13). Theft is a meaningless concept in the absence of private property. But the theory of justice which many are advocating says just the opposite: that one’s property is not, in fact, one’s own; that it justly belongs to “others.” Which others? Presumably, others who are in need of it. In this case, it would seem that theft for the purpose of alleviating one’s need would be just. In fact, we couldn’t even call it theft. Theft presupposes that the property is being taken away from the rightful owner. If anything, on this view of justice, the one who “worked hard” for his wealth is stealing from the one who has less wealth (for whatever reason), and the one with less wealth is merely carrying out justice when he takes the property which is “justly” his. This, I submit, cannot be defended by Scripture or by reason. And that concept—causation—brings us to the alternative theory of justice. On the causation-based theory, one’s rightful property is determined, not by one’s needs, but by whether or not one has caused that property to be what it is. This is not to claim that the human producer is the sole cause of his wealth (as though God were not the ultimate cause). It merely recognizes that the human producer is a cause of the wealth—that he is the primary human cause of his wealth; and in virtue of his causal role, that he justly deserves to be the owner of that wealth. Another way to think about this theory of justice is to think in terms of what one has earned. In fact, that’s the way the Bible talks about justice when contrasting it with the grace (i.e. unearned favor) of God in the gospel. “For the wages of sin is death, but the free gift of God is eternal life in Christ Jesus our Lord” (Rom. 6:23). Wages are what you earn. The justice of God, Paul argues throughout Romans, would demand that God give us the death we have earned (through our “wages of sin”), but the free gift (i.e., that which we do not deserve) is eternal life in Christ. The whole dynamic of justice and grace in the gospel hinges on this merit-based view of justice. But what about other forms of justice and injustice, beyond issues about property or wealth? What about slavery? Murder? Oppression? How do these issues square with this causation view of justice? In a way, the causation view of justice regarding property is an outgrowth of a more general view of justice which recognizes that—on the horizontal level, in relation to other humans—each human being owns his own life.4 Another way to say this is that every man has a fundamental right to life; that any threat to a man’s life by another is an act of injustice. The most obvious threat to a man’s life is murder, but there are other, similar threats. Slavery, for instance, may not take away a man’s life (in the sense of killing him), but it does take away a significant aspect of his life, which is his liberty to live as he sees fit. How does this relate to the causation theory of justice regarding private property? To answer that, ask yourself: what is property, or wealth? It’s the product of human creativity. Wealth is produced. A net, a spear, a rifle, a tractor, an airplane, an oil rig—all of them are the product of human ingenuity; of men investing part of their life (such as their time, their talent, their labor, and especially their mind) into the production of something valuable. Because of this, a man’s property is an extension of his life. To take away his property is tantamount to taking away the portion of his life (his time, his energy, his focus, etc…) which was poured into creating that property. And that is why it is unjust to take away a man’s property—whether it is needed or not. No man’s need gives him a right to the life (or therefore, the property) of another man. No amount of need could ever justify theft, just as no amount of need could ever justify slavery. In the end, they are the same thing: forcibly taking away part of the life of another man. We’ve talked about justice between individual men, but what about systems of injustice—or of oppression? Does this theory of justice allow for recognizing such a phenomenon? The answer is: of course. But only if we remember the definition of justice being used. Many who speak of “systems of oppression” today point to the existence of things related to need, and infer that since unmet needs exist in some systemic fashion, this must be evidence of systemic injustice or oppression. But the causation theory of justice does not look solely to needs or to suffering. Rather, it looks to the cause of the needs or the suffering. Is the need caused by theft, or fraud, or slavery of some form? Or, is it caused by mere bad circumstances, poor decisions, or slothfulness? If the former, then justice should be swift. If the latter, then no injustice has occurred. There are plenty of examples of true injustice (i.e. theft, fraud, or slavery) on a systemic level in today’s society—but they are quite the opposite of what most would think of when speaking of “systemic injustice.” Incidentally, the true systemic injustices (which I am about to name) are also typically the cause of much of the suffering of the poor. One glaring example of a systemic injustice which hurts the poor is minimum wage. The minimum wage is unjust because it prevents men from living according to their own judgment; from voluntarily entering into an employment agreement at a certain wage. In doing so, these laws make it much harder for unskilled workers to gain experience, and prices them out of the marketplace. Another systemic injustice is the welfare state, which forcibly takes money from the men who have produced it and redistributes it to men who have not produced it. It is a grave injustice against the producers of wealth, and it simultaneously and systematically harms the poor by encouraging them to rely on handouts and by stunting productivity in the marketplace which—over time—would allow for more general prosperity. One more systemic injustice is public education, which unjustly takes wealth away from those who produce it in order to “educate” other people’s children—in addition to (often) forcibly taking children away from their parents, in order to “educate” in ways highly disagreeable to their parents. These are just some of the true systemic injustices in society, for which the Church ought to be heartbroken, and against which we ought to fight. Much more could be said about the many other systems of injustice and oppression in our contemporary society, but that’s not the point of this article. The point is to demonstrate that when we consider true—Biblical—justice, it turns out that social justice (i.e., justice in society) looks radically different than what is currently being advocated under the guise of “social justice.” The problem with the “social justice” crowd is not that they want justice in society. It’s that they have bought into a false theory of justice, and as a result, what they are advocating for is more aptly called “social injustice.” If the Church wants to truly advocate for justice in society—and I think it should—then it must denounce the false need-based theory of so-called justice, and learn to embrace and defend true justice. See the tweet from TGC below. Tim Keller, Generous Justice: How God’s Grace Makes Us Just, p.17. This assumes that God’s command to give is not that we alleviate every need possible. I’ll have a follow up article on when and how God has commanded us to give.